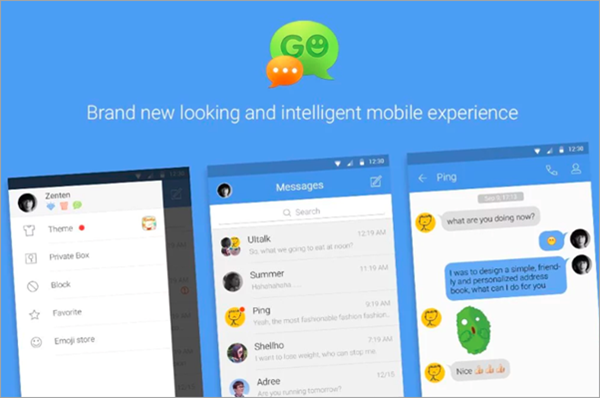 In the modern world of advanced technology, the communication method is revolving around the means of messaging apps. The majority of the people around the globe uses messenger apps like WhatsApp Messenger, Facebook Messenger, Hike, WeChat and many more. But the default messaging app which is installed on every phone is used very less because of some reasons. One of the main reasons is that the messaging inbox contains some credential data of the users like some of the delivery information of parcels, credit or debit card spent information, messages from telecom operators etc. Tip: Text messages may be deleted or lost due to many reasons, however with this Android Phone Recovery you are still able to recover the deleted messages from Android before they get overwritten. And these messages are not secured until it gets the protection from a message locker or something else which behaves as a shield on that message’s inbox threads. There are many Android locker apps which are available on the Google Play Store, and they pretends to be the best for security purpose. However, you just can’t trust all of them because it may be possible that some of them are not appropriate and may steal some data from your phone. 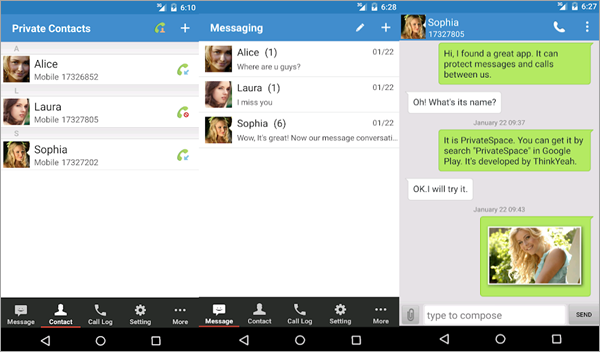 So, to avoid these situations we had listed the best 5 hide text message apps which you can install in your android smartphones to keep your text messages private on Android and protect them from the hackers and stealers. 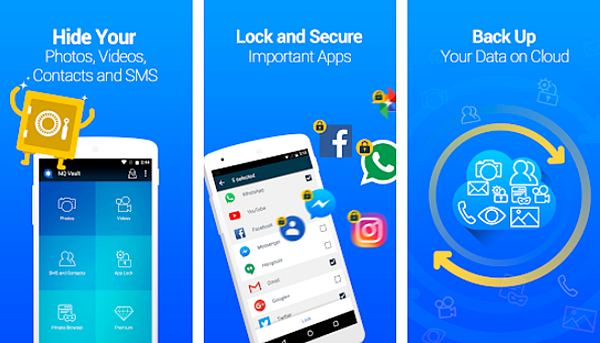 These apps are specially developed to behave as a shield which will protect your privacy and to make sure that your private SMS messages is secured. Just have a quick look at these 5 apps and install any of them to have a try. Tip: Do you want to know how to schedule SMS messages on Android? Here are the 3 most used ways to do that. This app is highly rated and has the maximum number of downloads in the Google Play Store because of its compatibility and a number of features it provides to the users. Once you installed this app, you can start off the thing initially by setting up of Personal identification number (PIN). This PIN is used to unlock this app to access the text messages and contacts. You can also hide this app whenever you want. Note: Anyone who had the password to unlock the App lock shield can access your messaging threads. So, make sure that you won’t share your password with anyone else, even with your family members too. After setting up the PIN, you can import all the contacts you want. After you import the contacts you want, these contacts are marked as “Private” and all the messages which are sent by these contacts will be hidden or we can say that it will not be shown to anyone. You can set a unique notification tone which will let you know whenever a message is sent by these private contacts. This app is really awesome and the features it provides are also brilliant. We too had tested this app and tried to break the security measures but we had failed to do that. So, you can give first priority to this message locker. This application is not very popular in the initial stages of its launch, but soon it gains the popularity and now it has more than 100million downloads and millions of good reviews too. The latest version has come with so many personalized features which cannot be neglected. So, if you don’t like the first app, then this is the best possible alternate app to hide texts and calls on Android. The user interface is just magnificent as compared to other apps and you will love to use this too. Once you download the app, you will explore the whole new world of advanced security features to encrypt messages on Android. You can set Personal identification number (PIN) to unlock the apps which are selected. Like as the Private SMS and Call app, you can hide all your messages and contacts at one place so that no one can access your data without your permission. The features are pretty advanced as compared to the Private SMS and Call application but as soon as you install the app, it will take some time to launch and once it gets operational, it is just outstanding. This application is free for all users. This app is genuinely one of the best app lock which cannot be detected by anyone who doesn’t know about the app. Unlike the other two apps mentioned above, this app cannot be hidden. Instead, as the name suggests it is a calculator application but in actual, it is app lock. 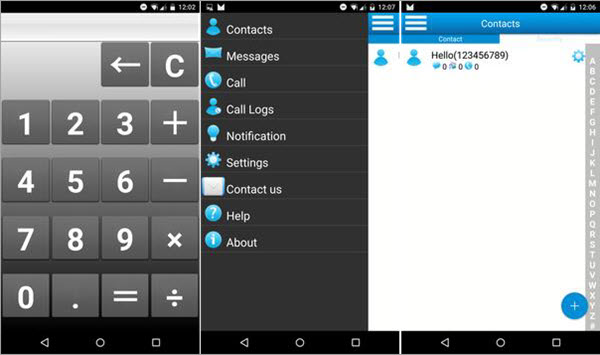 Anyone who looks to this application will think that it is a normal calculator application seemingly but in actual it is an app lock. The password is set by some arithmetic operation. For example, you can set the password as “1234-” or “1234+”. You have to press these keys and the app will be unlocked. All your contacts and messages threads are now protected once you enable the app lock. The user interface is not very attracting if you compare it with the other two mentioned above but the features of this app are pretty attracting. It should be noted that it is not free to use but paying some bucks for this application is not a wrong decision at all. This app will do the work as the name suggests. This app is pretty good when it comes to hiding SMS messages along with other multimedia on your Android device. Like as the other apps, after installation you have to import the contacts and SMS threads to secure them. These contacts will be labeled as Private and no notification will appear whenever message sent by these contacts arrived. Now, along with SMS and contacts, you can also hide multimedia files like videos and pictures from your gallery to a safe place where only you have the access to view them. This message lock app works by setting up a PIN. This PIN will be limited to you and no one can break this app lock by any means of hardware or software. This application is free to use for all users. This means that you won’t have to pay any subscription fees to use this outstanding app lock on your Android phone. 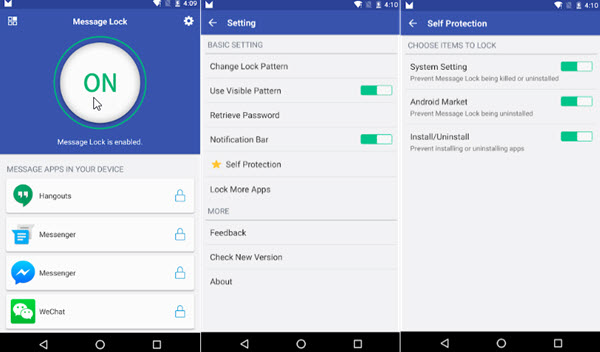 Message Locker is a kind of app lock which can be applied to other apps too. You can install this app for free and after you are done with the installation process, you can set-up a PIN which is the key to unlock the applications. You can apply the app lock on the default messaging app, WhatsApp Messenger, Facebook Messenger, Hike, WeChat and many more to protect your message privacy. You can even schedule WhatsApp messages with these apps. The user interface is quite appealing as you can see and if you want to add some apps under this app lock, then you can click on the “+” icon which will provide you the list of the apps which are not covered under this app lock. This application is quite safe to use and it has over 50 million downloads. Extending your privacy limits is not bad at all. Using these apps, you can put password on messages and protect your private data from the users who want to get that data to use it against you. These applications are tested and used by us personally and we are assuring you that you will not be encountered with any type of problem while using these apps. You can install anyone from them, and they all are very good and each one is having an edge over one another. Please share this blog so that other users will be able to protect their SMS messages on Android from the bad people. And just in case if you are using some other application for app lock, then you can share that in the comment section.